Always quarantine new birds for at least 6-8 weeks before introducing them to an established group of birds! New birds should be quarantined in a completely separate facility (i.e. with a separate air source, such as a neighbor's house) from the other birds to prevent the possible spread of disease and illness which your new birds may be hiding. A window period of 6-8 weeks is intended to give new arrivals sufficient time to show clinical signs of infectious diseases they may be harboring, so they can be identified & treated. 5 Please note that some avian infectious diseases involve an asymptomatic carrier state (e.g. giardiasis, Paramyxovirus infection7), and that subclinically affected birds may not be revealed as carriers simply by quarantining them. Diagnostic testing, therefore, should be sought from an avian veterinarian to search for many of these diseases.5 In short, quarantine alone is incapable of ensuring that the new arrivals are free of infectious disease; new birds should also be examined by an avian veterinarian during the quarantine period to search for hidden problems. By quarantining and having a vet evaluate any new finches before introducing them to already-established birds, you help to prevent transmission of disease, need for treatment, and possible deaths due to illness in your established birds. If you notice any signs of illness in the new birds, immediately place them in a "hospital cage" (a small cage with a heat source nearby) and seek veterinary care/treatment for them. With that said, new birds should be placed into a cage that has already been prepared for them with all the essentials (food, water, fresh bedding, and spray millet to entice them to eat). Make sure that you leave the lights on for them until you are sure that they have found the food and water, and make sure not to disturb them unnecessarily for a few days after purchase to allow them to settle in with minimal stress. Monitor them daily or several times per day (just by observing behavior) and watch for signs of aggression towards any cagemate(s) or signs of possible illness. Aggressive birds may need to be removed and housed alone, or placed in a larger cage (along with its cagemates) which includes plenty of visual barriers (plants--nontoxic if real, silk if fake), extra perches, and at least two sets of food & water dishes to help combat the aggression. 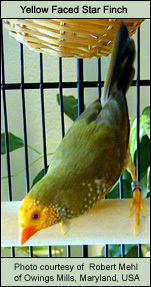 Once the quarantine period is over, you may introduce the new finches into the cage that houses the already-established birds (provided that the cage is large enough). To prevent any territorial bickering, remove all of the present inhabitants (if possible) and completely rearrange the cage (move perches to new positions, sleeping nests into different areas, etc.) and then return all of the birds, including the new ones, simultaneously. Watch them carefully for the first few days (at least 4 or 5) to make sure that the new birds are accepted and not ostracized. If they are rejected by the already-established birds, you will need to house the new finches separately so that they are not picked on to the point of injury or death. Note: if you have breeding birds with eggs/babies already in a nest, do not introduce any new birds into their cage until all babies are weaned so that the parents do not abandon their young.